I recently came across this beautiful watercolor painting over at Simple Art Project Ideas. It looks really incredible I think (as though great talent and skill are involved), but it turns out a child can make it! These are the first tries of my six year old and I which we finished in about half an hour (plus drying time). 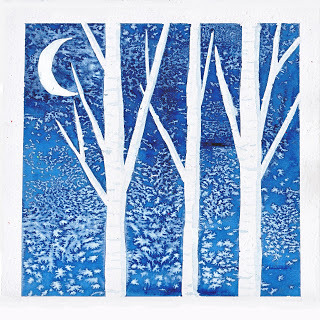 The painting is done on a piece of heavy watercolor paper with the edges, tree shapes and moon blocked out with painter's tape. The crisp borders go on as wide as one would like while the tree trunks and branches use torn tape to give their edges a more natural look. After the tape is smoothed down, the whole thing is painted and sprinkled with salt. Yup, salt! Who'd have thought this culinary staple would create such magic? We let ours dry for about 40 minutes (more might be necessary depending on the wetness of the piece) and then carefully removed the tape and salt. Lastly, while we did not, one might then choose to hand paint embellishments on the trees or wherever desired. In Tamara's piece, as well as in those we created, I thought the crystalline forms looked more like leaves than snow or stars so we tried out some alternate compositions with this in mind. With this one, I thought it might be interesting to make the "leaves" yellow and so painted an under layer and let it dry prior to adding the final paint and salt. It needs a little tweaking, but I still love the idea and the possibilities of a tree or alternate scene for each season. We were using coarse grain salt on these. I'm wondering what a finer sprinkling might do, especially for the star effect? Spoiler Alert: If you're on my Christmas card list, a certain element of surprise in our holiday greetings may now be lacking. We try to make it most years to the Fruit Loop out by Hood River in the Columbia River Gorge. It's another of our days of wholesome family fun on a 35-mile, scenic drive through a valley of orchards, forests, farmlands, and friendly communities. We stop at a few farms to sample delicious fruits and take our favorites home and also take part in some of the fun family activities hosted at Fruit Loop locations. Our favorite stop is Rasmussen's where Naiya always loves the corn maze and gets a kick out of Pumpkin Funland. This year it had a London Olympics theme. ...but a lot of fun. Our second stop was a new one this year. At Draper Girls Country Farm we got some delicious apples to add to the tasty pears we had picked up at Rasmussen and enjoyed the goats, the swing and a walk through the cornfield and orchards. Our last stop on the Loop was also an old favorite because of the grand fort/castle structure that we so enjoy there. Kiyokawa Family Orchards also has a delicious and extensive apple and pear selection. A few years ago we had taken this ridiculous photo of Ryan and Naiya playing in the super cool castle. Sometimes I have a strange wish to recreate goofy moments so I made them pose there again this time around. It was an absolutely gorgeous day and, I'm not exactly sure why, but it was also one of the best family outings we have ever had. The Autumn Harvest has long been a time to celebrate the plenty and hard work of the seasons just past. Traditionally ample food was available at this time of year and farming folk began to be freed up from long, hard working days. In our lives, the bustle of the start of the school year, the backyard gardening and the girl-child's birthday have passed and we have a moment of pause before the holiday season begins. The weather is changing and the light is beginning to fade even as we hold on to the last days of sunshine and short sleeves. It's the time of year when gratitude comes easily and many seem to feel genuinely thankful for all the goodness in our lives. We celebrate these internal and external changes with our Waldorf school community at the annual Harvest Festival. It's a day of family fun that includes singing, square dancing, a puppet show, music, crafts and a community potluck. Families bring the fruits and seeds of their home harvests for exchange and the children enjoy the simple activities and rambunctious outdoor play on the beautiful grounds. We picked up a copy of the new community cookbook, carved our Halloween Jack-o-Lantern, made corn dolls and pumpkin necklaces and even got in a bit of square dancing after lunch. Another lovely festival and traditional gathering to carry us into the coming season. Mists begin to rule the day. Clouds of dead leaves earthward drift. Shelter it from cold and harm. Deep below, new life will spring! As in year's past, for Naiya's birthday we hosted a gathering at Kruger's Farm on Sauvie Island. Once again we put together a little treasure hunt with some natural, hand made gifts for all the wee ones. Some Waldorf friends of mine occasionally ask about ideas for natural party favors, so I thought I'd share this year's collection. We began with a basket full of gathering bags made from twill tape and scraps of felted sweaters. The children were able to fill the bags with treasures along the way and then take them home to use and fill with all manner of leaves, pine cones, stones and whatnot on their seasonal nature walks. But we like for everyone to have fun! The felt piece measured about 6" x 18" and was stitched onto a 3' length of twill tape leaving a few inches to be folded over for a flap. I had thought of them as gathering bags but with quite a few left at the end of our party, I fear some of the boys may have seen them more as "purses" and opted to carry their treasures in their pockets instead. In a tree nearby, the children found their second item and a fairie offering a clue to the next. The idea for these name tag pendants came from those worn by some children I spied at summer camps in the wild parks of Portland. The wood rounds were cut from a branch of a hazelnut tree that our neighbor had left on the curb for firewood and we wrote the names with a wood burner pen. The tree fairie lead the adventurers to our garden gnome who overlooked a field of sweet critters. With so many children in attendance this year, I cheated a bit and purchased one of the prizes. We found these little glass critters at Audubon Society of Portland's Nature Store. After tarrying a bit with our gnome and selecting a critter, the children were led to a pixie village. The pixies (as is often the case) were not to be found, but they left their little homes for the kids to have as their own. These are surprisingly simple and quick to make. They're formed out of Super Sculpey and baked in the oven for half an hour. I painted them with water colors and I think this gives them a nice translucent, magical quality. The downside is that the watercolors will just wash off if they get wet. I figured that made them, in the long run, a more interactive play thing... the children could repaint them themselves!